The kitchen is a multifunctional room used for everything from fun family time to homework club, so it needs to be a dynamic and expressive space. With all the hustle and bustle of a busy kitchen, it can be easy for the aesthetics to get overlooked but by focussing on the little things, such as charming kitchen accessories, you can bring the whole room together. Appliances are designed with compact efficiency. Even though the smaller appliances don't take up much room, avoid cluttering your countertops with them. Countertop corners are ideal spots for small appliances, such as blenders, mixers, coffeemakers. It leaves the countertop uncluttered while making good use of a corner space that's often unused. Some toaster ovens, microwaves, can openers, coffeemakers and food processors are designed to mount to the bottom of your cabinets, helping to keep the counter space uncluttered. 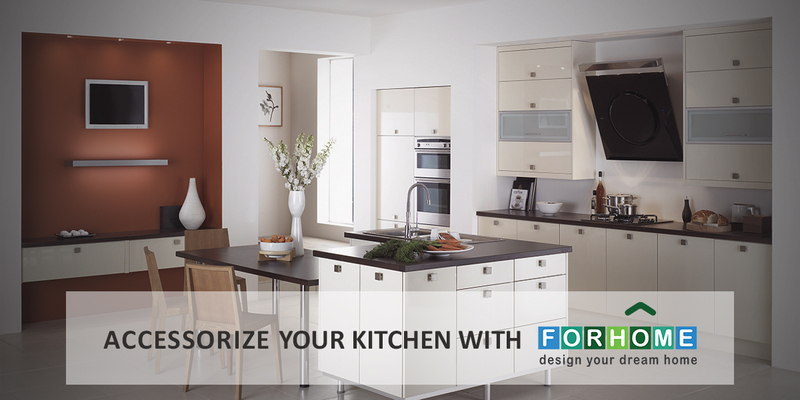 Make use of the vertical wall space in your kitchen. Open shelves add space for storing and displaying dishes, glassware and other items. Exchange a few solid cabinet doors with clear glass replacements. The glass doors are not only a decorative accessory but also add depth to space. Install glass or ceramic tile backsplash above your countertops to inject visual interest. Add new knobs and handles to your cabinet doors and drawers for an instant accessory update. Hang one or two large pieces of artwork to add visual interest, as well as to make your kitchen appear uncluttered and more spacious. Hanging an overabundance of small pictures is distracting and can make your kitchen appear disjointed and congested.